This tutorial will teach you how you can extract valuable information from time series, such as your sold copies on Steam or your Google Analytics. The previous part of this series introduced a technique called moving average, which has been used to attenuate the effects of noise in a signal. When signals represent an event that evolves over time, we are in front of a time series. Classical decomposition is a technique that attempts to find the main trends within time series. Time series that represents sold copies naturally contains several components. The trend component reflects the long-term progression of the sales. It’s a function of how effective your marketing campaign is, and it indicates how well your game is doing. This trend is perturbed by several other effects which contributes to the buying behaviours of players, but on a shorter term scale. Seasonal sales, monthly discounts and even which day of the week is it; all those events have a quantifiable, cyclic effect on the data and therefore make the seasonal component, , of the time series. Finally, what’s left is assumed to be caused by random, non periodic events and is called irregular (or residual) component, . If a small YouTuber covers your game, it can boost your sales for a day or two, but is unlikely to have any long term consequence. Those uncorrelated, acylic and low-impact events add to the “noise” of the time series. The seasonal cycle has a length of 30 days; it is reasonable to assume that every month has a similar influence on the sold copies. Knowing the length of a cycle will be essential to decompose our time series in its basic components. As described in the previous part of this tutorial, An Introduction to Signal Smoothing, a first possible step to highlight the true trend of the data is to use moving average. One of the assumption is that the data contained a 30-day seasonal cycle. If that is the case, we should choose a window that covers those 30 days entirely. Since 30 is an even number, is the technique that should be used. For all other odd numbers, standard is sufficient. This produces a new time series, which we call . In an ideal scenario, , but this is extremely unlikely. Removing from the original data produces what is called a detrended series. We can now replicate those ideal 30 days 12 times, to reconstruct the seasonal component of the time series . Seasonal component has known period . For instance, if we have a monthly cycle. The seasonal component is repeated times, meaning is composed of observations. For instance, if we have data for twelve months. There is one entry for each day. : the number of cycles in the data. Smooth using moving average to find the first approximation of the trend component, . 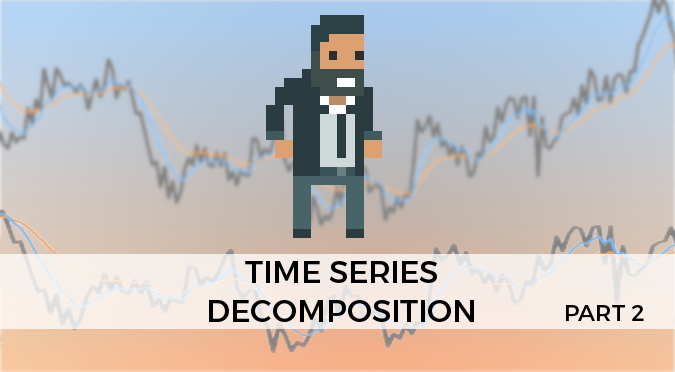 This tutorial shown a powerful approach to decompose time series in their main components. The technique has been developed for financial purposes, and it works very well with sales data. The main drawback of the classical time series decomposition is that it does not work well with random events, or multiple cycles. Real sales often exhibit not only monthly but also weekly and quarterly cycles. I really enjoyed reading your article. Thanks for your great effort on writing this article.